Short selling is the art of making money from declining prices in a security, index or any commodity. To short sell a stock means to sell a stock first and buy it back later at a cheaper price. It may be confusing to the new trader but when you short sell something you intend to make money from declining prices. Period. When you buy a stock, you anticipate that it will go up. So, we call it 'long' a stock. On the other hand, if you anticipate that the stock will go down in price, you 'short' the stock to make money when the stock goes down. Basically, you make money short selling when a stock goes down. I highly recommend that you take some time to read Investopedia's Tutorial on Short Selling. You will learn all the basics and how short selling works. Suppose you think that Apple shares are going to go lower in a week's time. The current price is $100. After you did your analysis, you think that Apple may drop to $95 in a week's time. So what do you do? In order to truly understand how short selling can help you make money in the stock market, I need to show you some charts. Charts are the way that stocks communicate to us what they have done, what they are doing and also what they are likely to do. One reason why short selling works very well for a trader is because stocks tend to move in trends. A stock will move from uptrend to downtrend and subsequently back to uptrend. A stock will not move in one direction forever. It may move up over longer term charts like yearly charts but you would be foolish to think it will not go down in shorter term charts such as the daily charts. Since stock moves in trends, a trader can take advantage of this fact and short sell stocks that are beginning a downtrend. 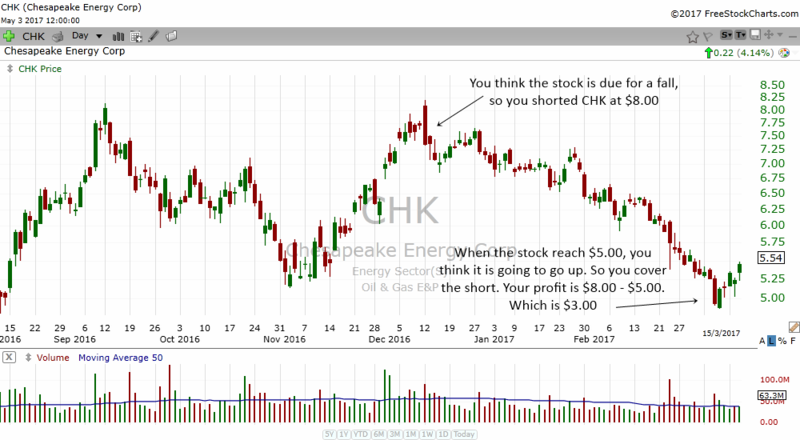 The first chart shown here is the chart of Chesapeake Energy which is an Oil & Gas E&P stock. From November to December, the stock had a very nice daily uptrend. If you bought the stock as it moved higher you will make money no doubt. Somewhere in the middle of December, the stock had a bearish engulfing pattern which mark the short term top for this stock. The pattern appeared near the old highs which acted as a resistance to the stock. What this means is the area kept the stock from rising. Chesapeake soon drifted lower. Imagine for a moment that you shorted the stock when you see it form a bearish engulfing pattern at resistance. You anticipated that the stock is topping and about to begin a new downtrend. So you shorted the stock at $8.00. As the stock moved lower, you make more and more money. When you short sell a stock, you make money when the stock moves lower. Simple as that. Eventually the stock reached $5.00 and you feel that the stock has bottomed. So, you buy back the stock at $5.00. The difference between the original price you shorted the stock and the price you bought back the stock is $8.00 - $5.00 = $3.00. Therefore, you have a profit of $3.00 for this short trade. Let's say you have actually shorted 50,000 shares of this stock. So your real profit will be 50,000 x $3.00 which equals to $150,000. Not bad for waiting 3 months for the stock to go down. Let's take another example. This time it is Apache which is another Oil & Gas E&P stock. Notice that this stock is in the same sector as Chesapeake. In fact, the stocks in this sector topped out around mid December 2016. 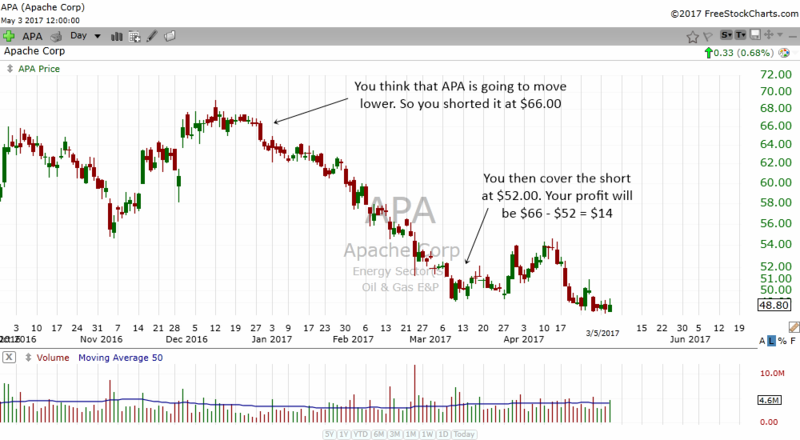 You feel that this stock is topping just like Chesapeake is topping and so you shorted 50,000 shares of Apache at the price of $66.00. The value of the short will be $66.00 x 50,000 = $3,300,000. Somewhere in March, your excellent analysis tells you that the stock has bottomed. Therefore, you covered the stock and closed the position at the price of $52. Your profit per share is $66-$52 which is $14 per share. Because you shorted 50,000 shares, your real profit is 50,000 x $14 which amounts to $700,000. That my friend is how you make money when a stock declines! One of the pros of short selling is that a stock can go down a lot in a short period of time. It may take a stock 1 year to go up 30% but a stock can lose 95% of its value in 6 months. That is why many professionals like to short sell a stock. Stocks that go down like these are usually stocks that lack the fundamentals to support its stock price. The company may no longer be profitable or the sector or industry is having a really bad time. Take a look at the stock chart of DRYS above. Notice how in November 2016 the stock had a price of $1000. The stock was a bit overbought and had a climactic sell setup. 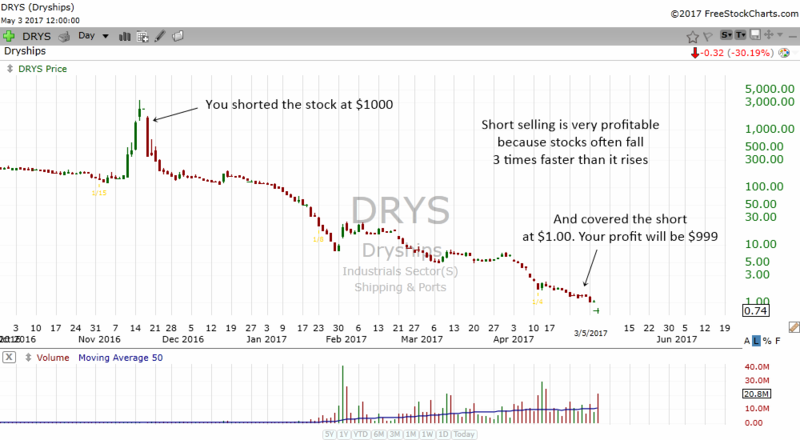 If you had taken the short setup and shorted DRYS at around $1000, you would have made profits of $999 per share when the stock drop below $1 half a year later. With short selling, a trader or investor should not fear a bear market anymore. Neither should he or she be afraid of a downtrend in a stock. Once you learn how to short stocks, you can profit even when your stock or the market falls. Turn a drop in stock prices into your personal opportunity. That's the beauty of the US stock market. In some countries, traders can only go long and not short. In the US, most stocks can be shorted. Therefore, traders who study and master the art of short selling will be able to profit even when a stock falls.